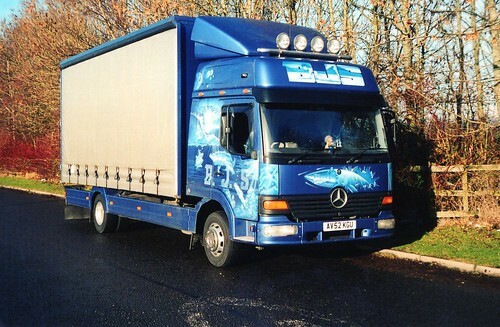 Have you ever wondered about having a bit of a customised truck? Something with a bit more than just a coat of white paint? Yea I did too once, but I wouldn’t do it again. Really I wouldn’t. I was doing well with my company and I doubled the fleet size to 2 trucks! I wanted to have the shiny wheeled slightly customised truck so it would stand out from the crowd. 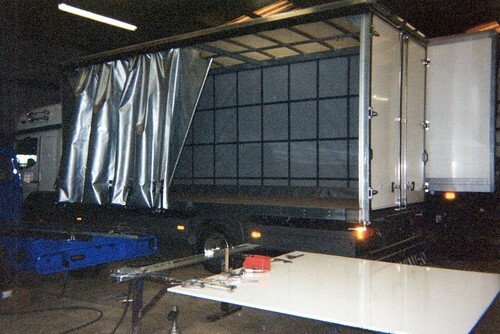 It started with the plain white Mercedes Atego that you see above. 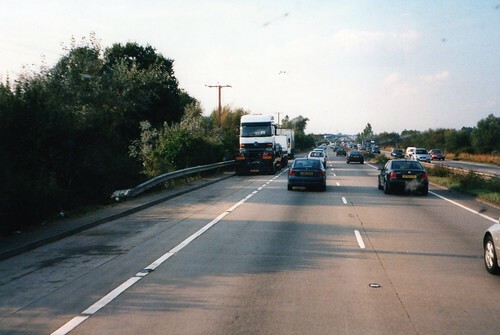 I spotted it on the A12 on my way back to Braintree one day. It was on it’s way from the dock to the bodybuilders, Colliers Truck Builders of Maldon (Essex) on the back of a Brit European truck. As it goes I went back and found the truck parked up for the night near Maldon, the driver let me even climb up and sit in it! Here she is nearly finished, as you can see its all plain factory colours, so next it’s off to the paint shop. 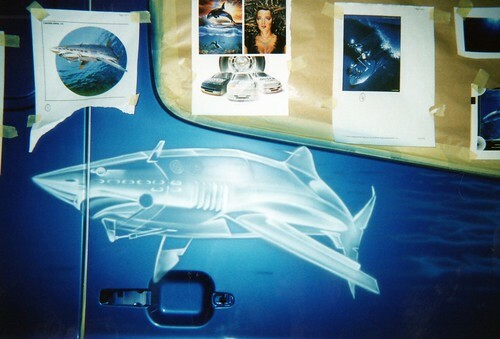 I had always wanted the truck to be metallic blue, but I still had no real idea of what artwork i’d have painted on. I found an airbrush artist in Colchester called Simon. 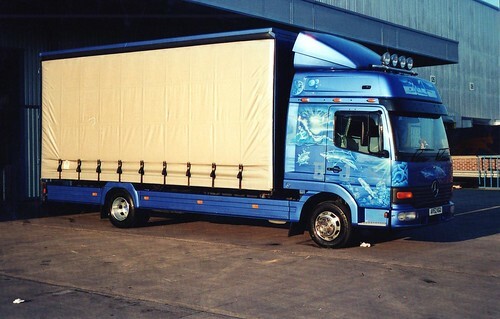 Simon had painted artwork on a few trucks, some of you may remember a fleet of blue DAF’s that used to do container work I think, that had airbrushing on. I had a few meetings with Simon about what we could do. 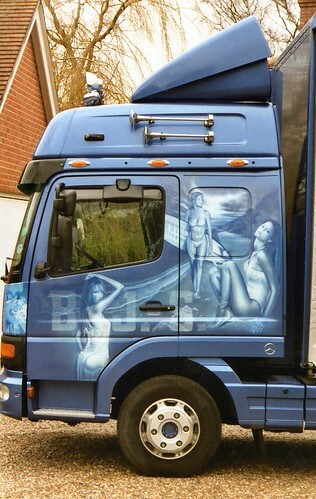 I had already wanted a few ladies painted on the truck – Why? Coz I was a young man! So I had to painstakingly find a few pictures of some attractive women, god that was a difficult job!! that was one side sorted. For the other side Simon had suggested some sort of sea/sky theme due to the blue. I had also wanted to only use white paint for the artwork as I’m not a fan of a million colours on a truck, although some trucks still look amazing (Coles & Sons that is!). Simon showed me some metallic fish artwork that I actually liked the look of. They were robot like fish that were originally done in silvers as they were supposed to be made of metal. The artist’s name was Soroyama. Next it just left the 2 front corner panels of the truck which Simon suggested could again be anything, I only came up with a CD cover I had, the other side was left to Simon. All in all it took 2 weeks to complete the whole painting exercise. As you can see Simon worked round the whole cab of the Atego panel by panel. I stood and watched for a while and I was just totally transfixed, watching stroke by stroke as the artwork appeared before my eyes! 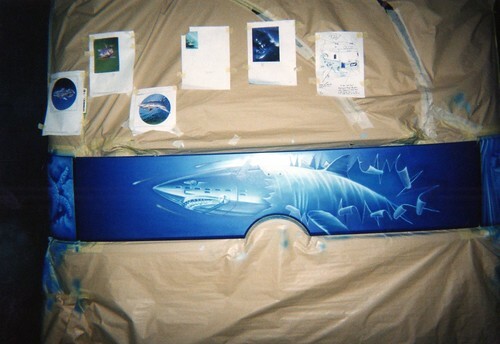 The front panel with the big shark bursting through was obviously going to get plenty of chips, even with 3 coats of lacquer. To get over this for shows and what ever else, I had a second front panel made up and painted and I still have it now. The only bugger is, it’s bubble wrapped in the top of the garage! But at least I still have part of the truck. So how did it all turn out?……. It’s quite a job to get the whole thing sorted. Finding a paintshop willing to spray the truck, and keep it in a dust free workshop while the artwork is applied, then add a few coats of laquer. Lucky for me Simon used his contacts and this was sorted. Trying to think up pictures for each panel was a total headache, but in the end the only bit I wasn’t that happy with was the front corner panel with the starfish. The rest was as I hoped for, including the planets and stars on the driver side. I loved it. More importantly was it worth it? 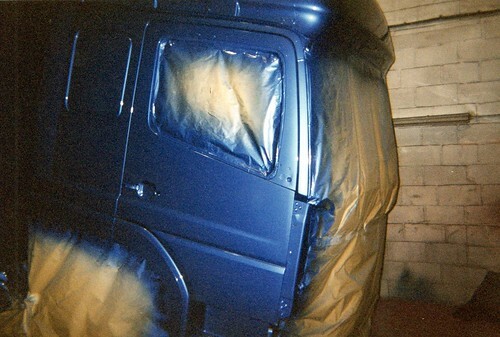 It’s a cost that is a gamble, will you ever earn back what it cost to have your truck painted? I think it cost me around £2,000 for the artwork including the laquer. Lucky for me at the time I could afford it, but I was even luckier to get some work that paid more than double what it cost me to have done. I was at a regular customer of mine and they had a visitor who loved the little airbrushed Atego and I ended up doing a lot of work over the next few weeks that easliy covered the cost of the artwork and I wouldn’t have got the job if it wasn’t for the artwork. Other than that having such a truck means lots and lots of people taking photo’s but better than that at some regular delivery points it meant the unloaders wanted to chat and talk to you about the truck. In turn this lead to being able to jump a certain amount of unloading queue’s, a direct result of having the artwork done. All in all I would reccomend doing it once, but after that? I don’t think so. 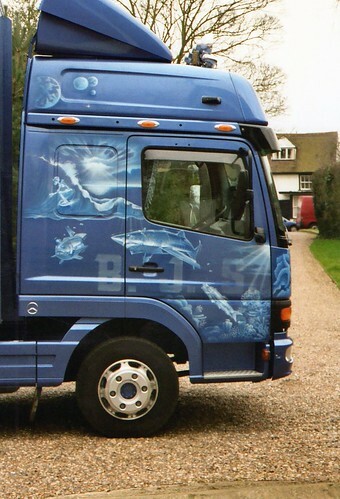 Great truck though, it did earn it’s keep and more all due to it’s artwork. 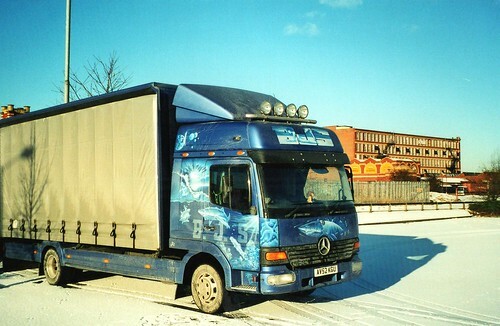 This entry was posted in BJS, Mercedes Benz, Photos, Tonka Toys by truckbloguk. Bookmark the permalink.